SAEINDIA Club of Government Engineering College Ajmer (GECA), was founded on 10th October 2015 with lots of efforts of Sh. Vinod Kumar Verma, Assistant Prof. Mechanical Engg. (founder of the club) with 84 student members. Aim of the club is to focus on those students who are interested to make their career in automobile sector, railway, aeronautics etc. or even for those who are always eager to know & to learn about car, bikes etc. SAE INDIA GECA Collegiate Club is working to create lasting change in the standards of learning in automobile field. Club is also focusing on student’s competitions like Baja, Supra, Epicycle etc. on National & International levels. Apart from this, Club is also involved in various social activities like free public car & bike checkup camps, plantations, blood donation etc.. to serve social responsibilities. All of us are inclined towards the help this generation of students but not everyone takes that one step to go forward and help them. Here SAE INDIA GECA Club plays the most significant role in enabling the students to channelize and unite to help themselves and other student. But let us not stop with just joining the club; let us spread this good news and work of club with others to encourage students to perform best in their lives. An interactive visit to Tilonia (approx. 50 Km away from Ajmer). 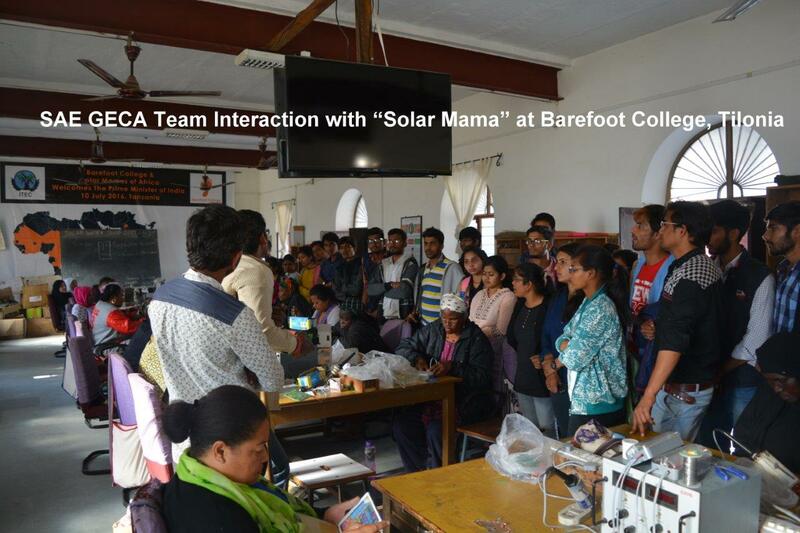 Students visited Solar Engineering College where many solar devices like parabolic dish, solar cooker, solar light etc. are prepared by Indian as well as "Solar mama" (women from various countries). Solar PV park has been visited at the campus. Learned how to use waste material in making useful products. Also enjoyed puppet show for various social awareness program followed by lunch. Also visited the fighter aircraft of Pakistan laying in the premises.